This introduction to random variables and signals is intended to provide engineering students with the analytical and computational tools for processing random signals using linear systems, developing the underlying theory as well as applications and making extensive use of examples. Computational aids, in particular, computer-based symbolic, the graphical and numerical computation programs MATLAB(tm) and Mathcad(tm), are used throughout for performing analytical manipulations and numerical calculations. 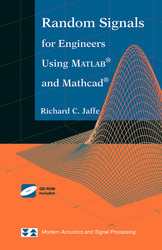 The accompanying CD-ROM provides MATLAB notebooks and Mathcad sheets used in the examples to develop methods for processing random signals. Intended for a one-semester course for undergraduates or beginning graduate students, the book covers such topics as: set theory and an introduction to probability; random variables, distributions, and processes; random signals, spectral properties, and transformations; and filtering, and detection theory. The large number of worked examples together with the programming aids provided on the CD make the book eminently suited for self study as well as classroom use and includes a set of problems at the end of each chapter. Complete worked solutions to these problems are available. - Introduction to Sets and Probability. - One Dimensional Random Variables. - Operations on Random Numbers. - Two Dimensional Random Variables. - Transformation of Random Processes. - Appendix A. Linear Signals and Systems B. Matlab and Mathcad C. Bibliography.